Tourism boards have been urged to stop promoting a North Somerset zoo which presents creationist ideas. The British Humanist Association (BHA) says Noah's Ark Zoo Farm undermines the teaching of science. 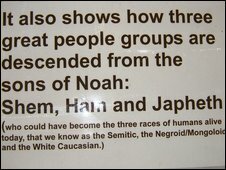 Signs at the zoo in Wraxhall describe how the "three great people groups" could be descended from the three sons of Bible ark builder Noah. A spokeswoman for the zoo said they viewed the natural world as a product of both God and evolution. Another sign at the zoo says animals hunt and kill food because "man rebelled against God". The zoo's website also explicitly rejects Darwinism, describing it as "flawed", and claims scientists are afraid to talk about "design" in the natural world. BHA education officer Paul Pettinger visited the zoo at the end of July. He said: "I found lots of creationist and pseudo-scientific beliefs. "They ask you to pray for animals, and so on. "We're very concerned because it will undermine education and the teaching of science." The BHA is calling on tourism boards to stop promoting the zoo. But Noah's Ark's owner Anthony Bush says his zoo simply presents a variety of views, one of which is creationist. Many creationists take a literal interpretation of the Bible's description of the origin of life and reject the Darwinian concept of evolution. "I think God created life. I have no idea when," said the former Evangelical preacher. "There's a lot of people who believe in Genesis who don't want to come out of the woodwork, but they don't want to come out of the closet because of the thought police." A spokeswoman for the zoo said: "We hold a view that the natural world around us is the product of both God and evolution. "Although technically creationists, we do not hold the stereotypical creationist views that the world was created in 6,000 years and there is no evolution." Tourism body Visit England has said it only checks the zoo under its Visitor Quality Assurance Scheme and has no opinion on content. The zoo is visited by 120,000 people every year, including members of school parties.